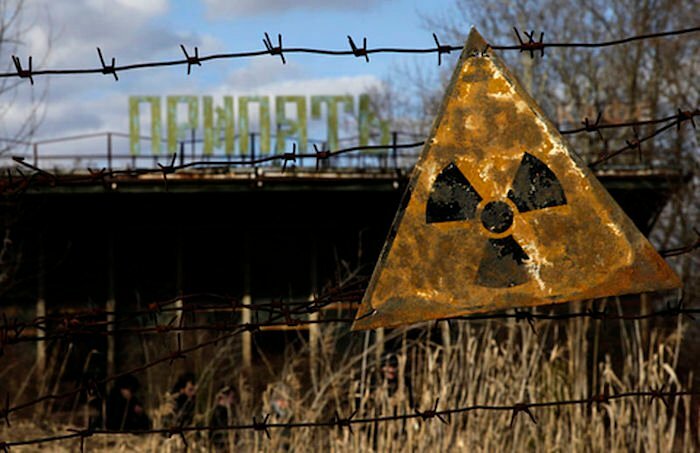 A radioactive sign hangs on barbed wire outside a café in Pripyat. Image: Diana Markosian under a CC licence. A new photobook by Polish filmmaker and photographer Arkadiusz Podniesiński is being crowdfunded on Kickstarter, to be published in October 2017. The book, entitled Half Life: From Chernobyl To Fukushima, will be the end product of a nine-year journey by Podniesiński into the heart of these radioactive zones, documenting the architectural destruction, human suffering and environmental impact. Having already made two documentaries about the disasters, and attracting international recognition for his shocking images, Podniesiński has already attracted some big names, with former Prime Minister of Japan Naoto Kan and former Soviet Union leader Mikhail Gorbachev promising to write introductory essays to the two respective parts of the book. The Polish photographer was granted special access to highly contaminated zones in Chernobyl, such as Reactor 4 and the closed zone in neighbouring Belarus, which saw as much as 70 per cent of the radioactive fallout from the disaster. Whilst in Fukushima, Podniesiński studied contaminated zones and displaced residents, currently living in crowded temporary housing. The required funding has already been achieved, but it's not too late to show your support in bringing this very special and significant project to life. More of Podniesiński's work can be viewed here.